What does it mean to be an entrepreneur? If you have a side hustle or you’re a freelancer or created a full-time job for yourself, does that make you an entrepreneur? As work fundamentally changes, we need more discussion around expanding the definition of entrepreneurship. 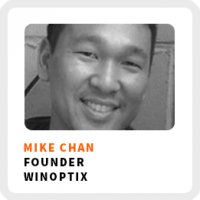 And that’s what our guest Mike Chan is here to discuss with us. He believes entrepreneurship has less to do with describing how you work and more about how you view your work. Mike is a seasoned entrepreneur. He has started a few different businesses and work for himself in various capacities. Currently, he’s working as the founder WinOptix, a platform to help government contractors improve their bidding process. How small, consistent actions can help you build quality over time. Do at least 25 customer interviews before even starting on building the product. Build your team slowly when starting your business to avoid bad fits. Explore alternative ways to fund your business. Core work activities + habits: 1) Talking to customers. 2) Understanding how the customers will interact with the product. 3) Doing the analytical work to build out the product to address customer needs. Regains focus by: Stepping away from work by going for a walk, grabbing a snack or drink, or just disconnecting in general. Sometimes using the Pomodoro Technique. 90-day goal: Get the first version of WinOptix sent out to customers. 1) Start a debt-free business, if possible, by funding it through consulting or having a day job. 2) Demonstrate to potential investors that you have the needed skills to make this project succeed.